We are reckoned entity of this domain affianced in providing an enhanced quality Wooden Ash Trays. Rana Overseas leading Manufacturer, supplier and exporter of Wood Aluminium Ashtrays, We have wooden ashtray in Sheesham Wood, Mango Wood and in Antique look, We have various sizes and various designs and shapes, Our wooden ashtray are carved and we do also have in Brass Inlay and White Inlay work, Our wooden ashtray are durable and made up of good quality. Matching up with the ever increasing requirements of the customers our company provides Bamboo Ashtray. This Bamboo Ashtray is made from Giguntus variety of Bamboo. Our product range is widely demanded in different hotels, homes, bars and restaurants. 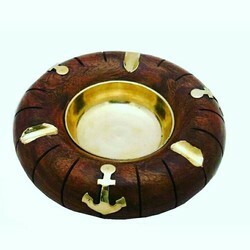 Being a most reliable organization, we are engaged in offering a wide range of Round Wooden Ashtray. Natural Wooden Ash Tray, Size/dimension: 4" X 4" X 2"
Size/Dimension: 4" x 4" x 2"
By leveraging upon our extensive market knowledge, we provide the best array of Wooden Ashtray. 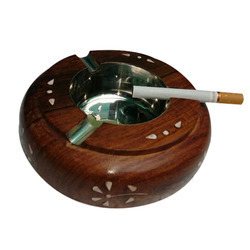 Keeping in mind the vast necessities of the patrons, we are engaged in providing wide range of Wooden Ashtray.